Disneyland, California: Large hotel rooms and family suites near Disneyland that can accommodate 5, 6, 7, or 8 are listed in alphabetical order below. The room price or rate range of each hotel is indicated with the $ symbol. See the $-symbol key in the sidebar. Click on the hotel name for more details. The detail information includes a location street map, the hotel’s address, phone number, website link, email address, and how to book. The listed hotels offer a variety of room configurations to sleep a family. Included are one-bedroom and two-bedroom suites. Large rooms with 2 Queen beds or a King bed offer additional sleeping arrangements with a crib, pull-out sofa bed, or a roll-away extra bed. One hotel even has a set of bunk beds and two bathrooms. If you know of other hotels with family suites near Disneyland that can sleep 5 or more in one room, please email us or comment below! 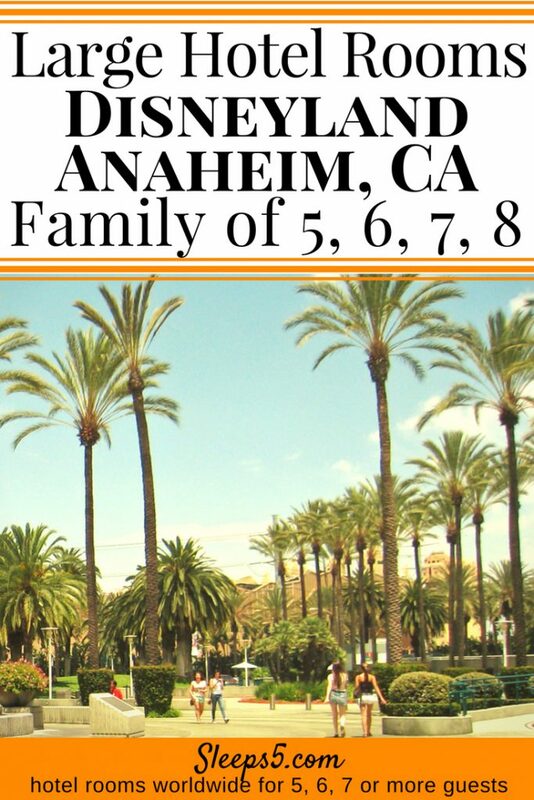 Our aim is to help family travel planners find the best place to stay while visiting Anaheim with kids. There is more to the city of Anaheim than its famous mouse. A fun outing off the beaten amusement park path is the Packing District on Anaheim Boulevard in the historic part of town. The Packing District is a conglomeration of fun eateries in refurbished historical buildings with frequent musical performances. For Anaheim visitor coupons from the Visit Anaheim tourism website, click here. Use the Sleeps5 menu above for lists of family hotels in other California and west coast cities. Included are hotels for families of 5 or 6 in Palm Springs, which is 90 miles from Anaheim, and San Francisco hotels that sleep 5, 6, or 7. 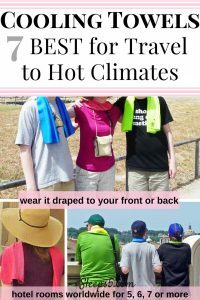 You might also like our blog posts about Disney: One lists 25 Best Disney Websites to Save You Money, and another describes How Much it Costs for typical Disney World vacations. Another fabulous and well priced hotel for families of 5 in Anaheim is the Annabella Hotel. It is walking distance from Disneyland and California Adventure. The family suites have beds for 5. The pool is heated. There is a onsite restaurant and Downtown Disney is walking distance away. Parking onsite in front of hotel room. Thank you so much for taking the time to let us and other readers know about the Annabella Hotel. It does sound perfect for families heading to Anaheim and visiting Disneyland. I can’t wait to add it to the Sleeps5 Anaheim page. I know there are other Anaheim hotels on my list to add, so we’ll do that very soon, too.